Net Weight: Packet (35 seeds)1/16oz (625 seeds)(+$26)1/8oz (1250 seeds)(+$49)1/4oz (2500 seeds)(+$97)1oz (10000 seeds)(+$344) This item is currently out of stock! 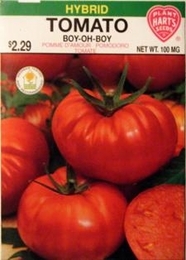 This Beefsteak type tomato produces light red fruits of extremely large size, often over 1 pound. Excellent flavor, solid flesh with few seeds, these tomatoes are produced on large, disease resistant plants over a long season. This variety grows to 5 to 6 feet high and the highest quality fruits will be produced on plants that are staked and pruned. Tomatoes are of tropical origin and like warm weather. Do not set outdoors too early. Maintain good fertility during the season.